Pack size: 1 x contact lens case. Rigid lenses can be essential for many contact lens wearers the world over, but keeping them clean is an important part of wearing them. 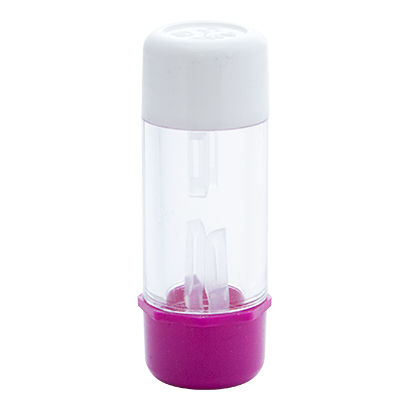 With the Total Care Contact Lens case, keeping your RGP lenses clean is made much easier. The Total Care RGP Contact Lens Case is intended to complement Total Care solution products, keeping RGP lenses safe and thoroughly bathed in cleaning solution all night long. It’s important to keep your lenses clean and free from any bacteria before they go anywhere near your eyes. This RGP lens case will help ensure your lenses are bathed completely in solution each night and can be used when travelling to ensure that right and left lenses don’t become confused. We recommend using this lens case in conjunction with Total Care Wetting and our Value for money Total Care Multipack. Comprehensively clean RGP lenses with the Total Care Contact Lens Case in conjunction with the Total Care lens and Total Care Products. AMO have taken everything into account, and have even included special pincers to extract and insert contact lenses when using the Total Care Contact Lens Case. Intended for use with RGP lenses.